Postcard showing the American Legion Hall, located at the 900 block of Orange Avenue on Lake Ivanhoe. The hall was constructed in 1938 with a Spanish Colonial Revival Style. The building cost $82,000 and replaced an earlier American Legion Hall built on the same location in May of 1924.The World War I German cannon that was on display outside the entrance was donated to the World War II war effort as scrap metal to make shells to fight Germany once again. Original 5.5 x 3.5 inch color postcard by C. T. American Art: Asheville Post Card Company, Asheville, North Carolina: Private Collection of Thomas Cook. Digital reproduction of 5.5 x 3.5 inch original color postcard by C. T. American Art: Asheville Post Card Company, Asheville, North Carolina. Originally created by C. T. American Art and published by the Asheville Post Card Company. American Legion. The American Legion. Indianapolis, IN: The American Legion, 1981. PUBLISHED BY ASHEVILLE POST CARD CO., ASHEVILLE, N. C.
C. T. American Art. 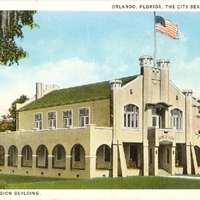 “American Legion Building Postcard.” RICHES of Central Florida accessed April 23, 2019, https://richesmi.cah.ucf.edu/omeka/items/show/970.